I thought I was pretty familiar with the different aspects between North Carolina and Texas (and California, for that matter, because my brain still goes to California-mode quite often), but with Sam's move to the town of Clayton, which is a little more south and east than where he was living, I found a few new items of interest. I did a double take when I first walked by these, and had to do a search on them, because RED hot dogs?? 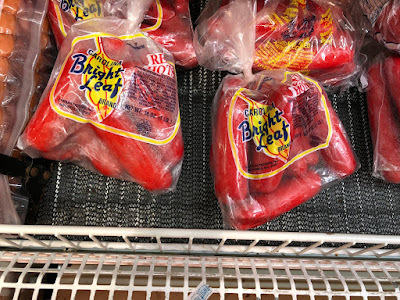 I found an article about them that made me realize why I'd never seen these in the last four years of visiting North Carolina and going to several different grocery stores: ground zero for these red hots is Johnston County, or JoCo to the locals - and that's where Sam now lives. 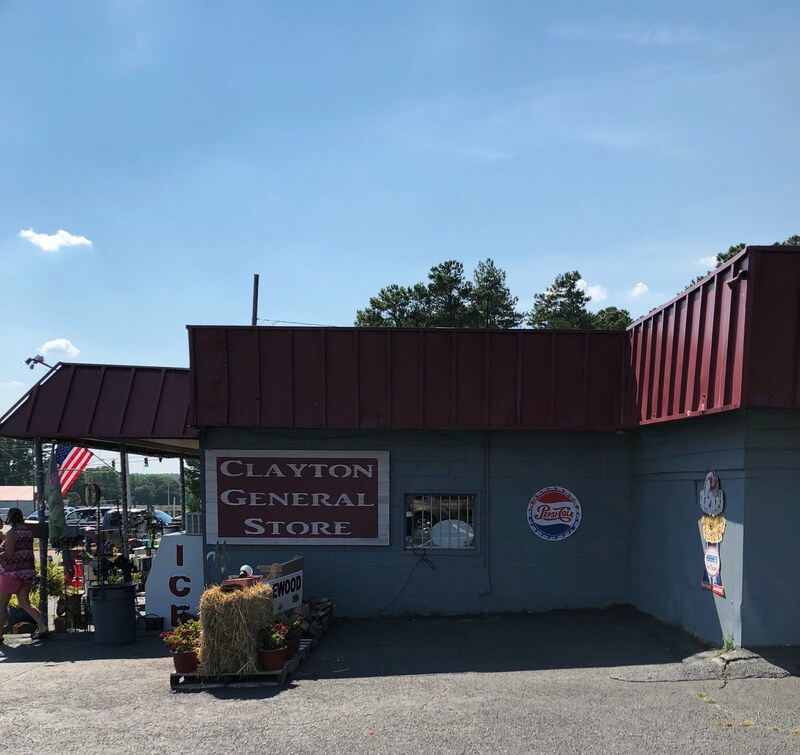 In fact, the article references a little restaurant that we drove by when we were checking out downtown Clayton; in case you're wondering, no, I was not interested in trying them out. For what it's worth, Sam did stop by the local Char-Grill and order one a few days after I'd gone home. He said it wasn't anything different from a regular hot dog, but I don't think I could get past the visual to try one. Somehow I didn't manage to take a picture of the front of this store, but if you are ever in Clayton, it's worth a visit. We were working really hard the entire time I was there, and in the evening, we'd sit in Sam's screened patio and indulge in some ice cream. We started out with Blue Bell, which is a staple here in Texas, but expanded to Lowe's brand ice cream, which tasted even better. 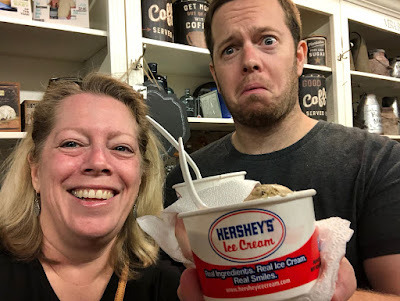 But then we hit the mother lode - the best ice cream we'd ever tasted - Hershey's ice cream. Neither of us had ever heard of Hershey's ice cream, but when we walked in to the Clayton General Store, which is about as charming as you might imagine, we noticed hand scooped ice cream was for sale, so naturally we had to check it out. Never mind that it was only 10:15 am - a little pre-lunch ice cream was just the ticket to keep us going. Is there anything better than an ice cream truck on a hot summer day? Ice cream for dinner? Sure, why not! I told Sam that if we hadn't been eating ice cream pretty much every day, we probably would have lost weight because we were really active, what with the move and the yard and everything. But sometimes you have to live a little, especially when you are doing something hard for days on end. Have a great weekend, and if you're in an area that sells Hershey's ice cream, by all means - get you some! I love me some ice cream! Now I will be on the lookout for some Hershey's ice cream which I never heard of before. Thanks for the tip. 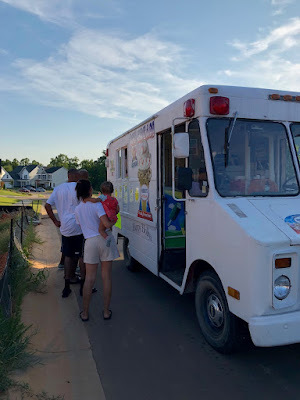 Yep I remember the ice cream truck from when I was growing up we still have them down here in fact one of my neighbors is the ice cream truck lady. I used to love to get the orange sherbet push ups on a stick seems like what I remember. I love small charming southern towns and it seems like Sam lives in one lucky guy. I remember those push pops - they were so good! Trying to comment and hit delete by mistake. You’d think it was Monday! You definitely ‘earned’ that ice cream!!! Hard work = ice cream every day sounds like a good equation to me! I’ve seen red hots because the navy base where I do product demos sells them. Interesting that Sam said they taste like a regular hotdog as I’ve always assumed they were spicy hot. If they ever demo the red hots, try one and let me know what you think! What a cute town! And with a general store no less?! How cool! I'm pretty sure I remember seeing at least one "red hots" hot dog stand in Chicago. I don't think they were bright red though, but perhaps that's where the name comes from? Ooh, Handels...that's going on the list, too! What's wrong with ice cream every day? I have had ice cream for dinner. never had a red hot dog, though? I like the way you enjoy your ice cream! I live about an our from Hershey! You should visit it sometime when you come to the East Coast. amazing. But actually have you ever had Turkey Hill ice cream? If not you NEED to find that. I've never seen the red hot dogs and have never seen them in a bag like that. Turkey Hill is going on the list - I wonder if it's sold in North Carolina? So it sounds like, from some of the comments, that Hersheys candy makes the Hershey's ice cream? Anyway, with all this ice cream talk, I've got a rare hankering for some good ice cream! I might have to try out the little ice cream shop in our town. I've never tried it and people say its really good ice cream. So did you try the local ice cream and if so, how was it? I guess I didn't realize Hershey's ice cream is not national. It's in almost every rest area along the interstate here LOL. And I'm with you on the red hots. That dye? Ick. Wait wait wait - your rest areas have ICE CREAM??? I"d probably take a pass on those red hot dogs. Heck, I rarely eat hot dogs, but red ones just give me the willies. Kind of like red velvet cake. Red dye anyone? I've never hear of Hershey's ice cream but I'd try that! Yeah, I'm with you on the artificial red coloring thing. I'm in Pennsylvania, so I'm familiar with Hershey's ice cream. And Fairtales also mentioned it- I was going to mention a dairy here in Lancaster County called Turkey Hill that makes yummy ice cream. I saw on their website it's in 49 states now. Hershey's Ice Cream is not the same company as Hershey Chocolate. 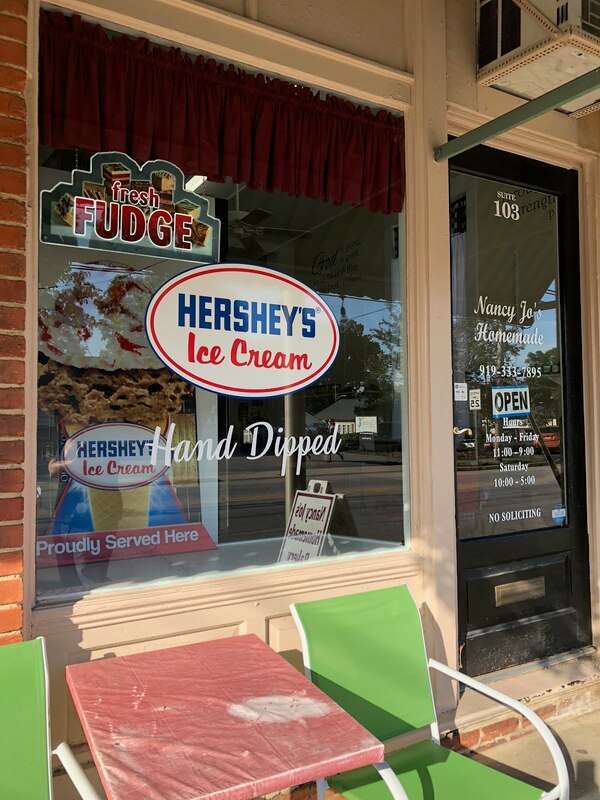 Oh, and Anne, I was in a Malvern PA today and got Handel's. Dairy farms are a thing here, and we have pretty many small, local ice cream makers. Which I don't buy very often! But maybe if I was helping with a big relocation project like you were!! I honestly had no idea there were so many different ice cream options across the country! Oh, and is Turkey Hill not just Kroger ice cream? I know Kroger owned them until very recently so I just assumed it was one in the same. Dying at the shake promo - hey, gas is expensive, so those shakes were a necessity! Ahh, ignore my Lowe's Food question from the other post! Yes sign me up for all that ice cream! I have never seen that brand!